Wrigley's Extra Sugar-free Gum. 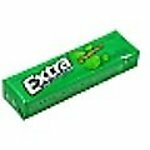 Enjoy the long lasting flavor of this sugar free gum. Each pack contains 6 sticks that are 5 calories each. Available in 2 great flavors, Spearmint and Peppermint.